I read recipe books like most people read novels. I adore them. They stretch my imagination in a million directions and the gorgeous pictures give me ideas on presentation, table settings and décor. Having said that, I don’t think that I’ve ever made a dish exactly to the printed recipe (with the exception of baking) as there’s always some ingredient or spice or herb that I think would be a better fit – according to my taste buds anyway. Experimenting is always half the fun. 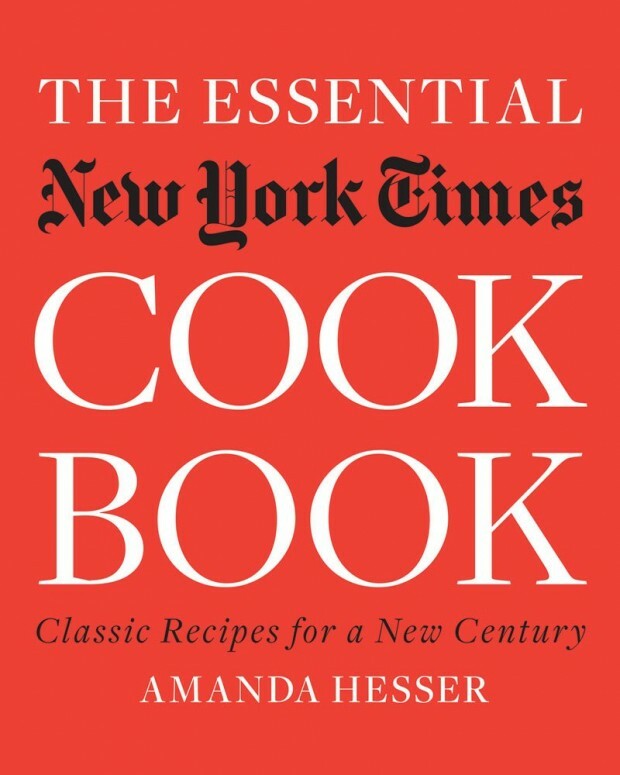 One of the newest titles I’ve been working my way through is The Essential New York Times Cook Book – Classic Recipes For A New Century by Amanda Hesser (who starred in the foodie movie classic Julie and Julia as herself). At a hefty 962 pages, I don’t know how long it’s going to take me to read it in its entirety but already I can’t stop. As a long time staff member of the New York Times and renowned food writer, Amanda was best-placed to put this book together for the media giant. It was clearly a massive task, culminating in a tome that celebrates the newspaper’s food archives of the last 150 years. Amanda selected the Times’ best recipes (testing over 1,400 of them along the way!) while making it a priority throughout to accurately represent the interests and passions of the paper’s loyal readers. The recipes include some of the world’s most beloved cooks and chefs, including Dorie Greenspan, Jamie Oliver, Julia Child, Maida Heatter, Tom Colicchio, Rose Levy Beranbaum, Mark Bittman and many more. But in the end it’s the stories around the recipes and the author’s personal comments that make this book such a delightful treasure. It’s a book that will keep me coming back again and again, as every recipe leaves me feeling like I could almost be in the room when these delicious dishes were first being made. In another example, a reader sent this email to the New York Times: “Every Wednesday I anxiously await the Dining Out section. I hope that you include the recipe for ham with a delicious sauce. The recipe/article appeared about 7 to 8 years ago. It was written by a man who said a friend had told him to purchase the cheapest cut of ham he could and coat it with the sauce. Guests loved his ham and were licking up the last bits with their fingers. I followed the recipe and had the same success, but now I can’t find the recipe in my pile of recipes I’ve cut out of the NY Times. 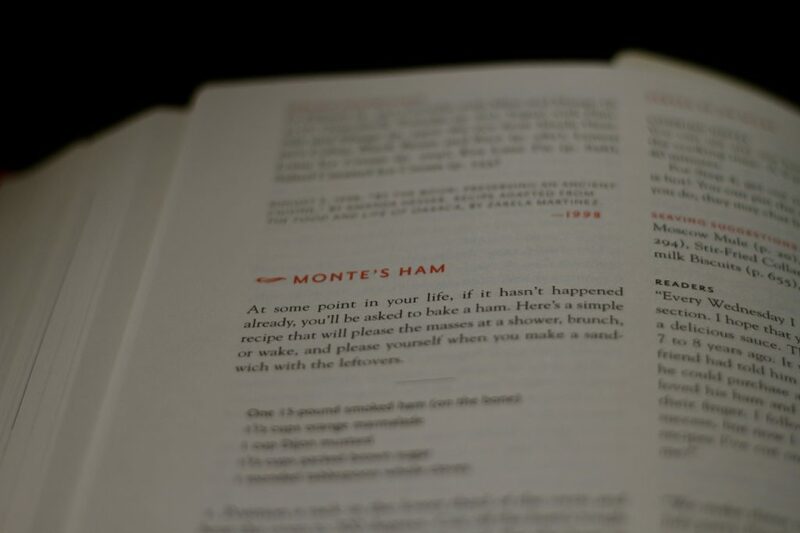 Can you help me?” The recipe the reader was requesting is called Monte’s Ham, a recipe by Monte Matthews, an advertising executive in New York back in 1998. With such a glowing report, who wouldn’t want to try this? I could just go on and on with other delightful excerpts but there are far too many and I’d be virtually rewriting the book. If your bookshelf can stand the weight, and you’re open to venturing a little outside of the commercial cooking box, this is a book you’ll be working with for years to come and grow to cherish forever.